I have this really odd habit of punishing myself by cooking food in my oven, such as I did last night, whenever New York City is placed under a Heat Advisory. Highs reaching the mid-90s this week? No matter! Relatively tiny kitchen with little air circulation that traps heat for hours on end? Who cares? I’m clearly a culinary masochist. I had uncooked chicken breasts in my fridge, an abundance of summer squash from a farmers’ market, and leftover hummus from when I invited friends over for cocktails and snacks a few nights back. A girl’s gotta do what a girl’s gotta do. I blasted the A/C in my bedroom, opened the door to encourage said cold air to spill into the living and dining areas, and went to battle against a 450 degree oven with a Pyrex pan full of raw poultry and two oven mitts. I won, though heart palpitations brought on by heat exhaustion almost got the best of me. Next time, I’ll just order Thai on Seamless, like a normal person. I was feeling advantageous, or, perhaps, just stubborn enough in the quest to clear some stuff out of my fridge. In the past, I’ve looked for other items to dress my chicken in. Garlic powder and olive oil usually win on any average night. At times, if I get a rotisserie chicken to pick apart, I’ll drizzle honey on it, straight-up. (That was a childhood favorite of mine. I’d do it whenever my parents would get an overly-dry rotisserie chicken from my hometown’s old Finast.) However, one night, many moons ago, when sautéing chicken, I saw hummus in my fridge. I plopped a spoonful onto my hot chicken breast and let it melt down. It was next level. The sauce it created was delectable. It brought forth a slightly nutty yet citric flavor profile. Initially, it never occurred to me to bake chicken with hummus coating it, but, why not? I tried it with great success! 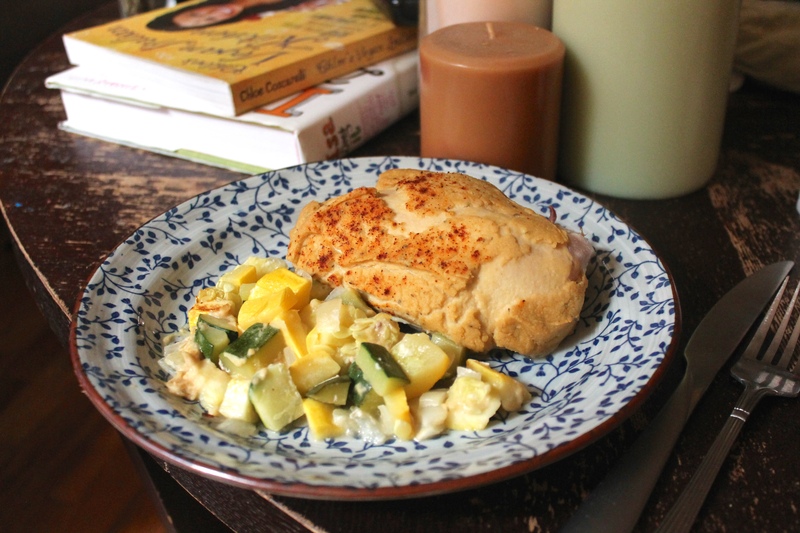 I’ll credit Gimme Some Oven with inspiring the summer squash pairing. I usually cook my vegetables on the side when making this dish, but, while baking, the hummus slowly drips onto the vegetables; mixed with the simmering chicken juices, its own sauce is created. It is beyond fantastic, borderline hedonistic, like all good meals should be. – After a couple of tests runs of this recipe, I’ve concluded that bone-in breasts hold up a bit better than boneless and yield juicer meat; that being said, thicker bone-in breast may take a few extra minutes of cooking time compared to boneless. I would suggest a 40 minute baking time for bone-in breasts that can’t easily be pounded down. Be sure to check chicken for doneness, regardless, prior to eating. 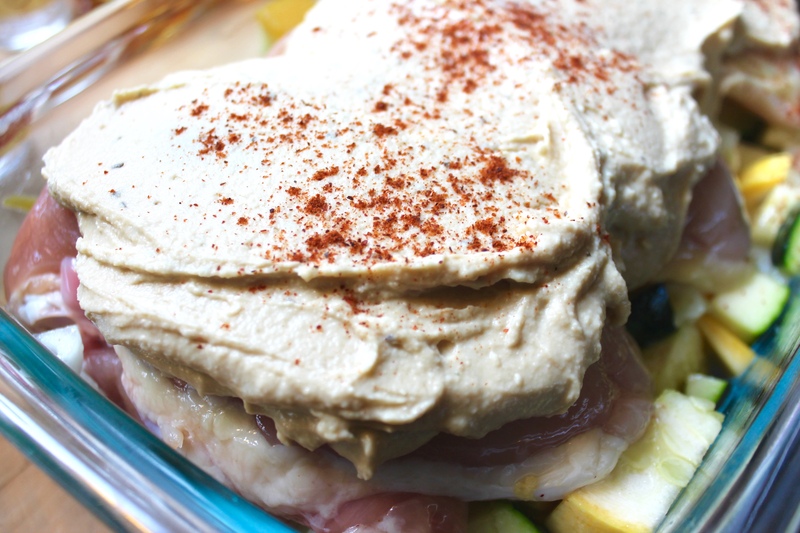 – The type of hummus you choose will certainly change the flavor profiles of this dish. I’ve made it with plain hummus and garlic hummus. For these photos, I used store-bought lemon rosemary hummus, and it was wonderful! The rosemary evokes a bit of an autumnal feel to the dish overall. 1.) Preheat oven to 450 °F. Grease one large baking dish and set aside. 2.) Pat chicken breasts dry. Season with salt & pepper, to taste, and set aside. 3.) 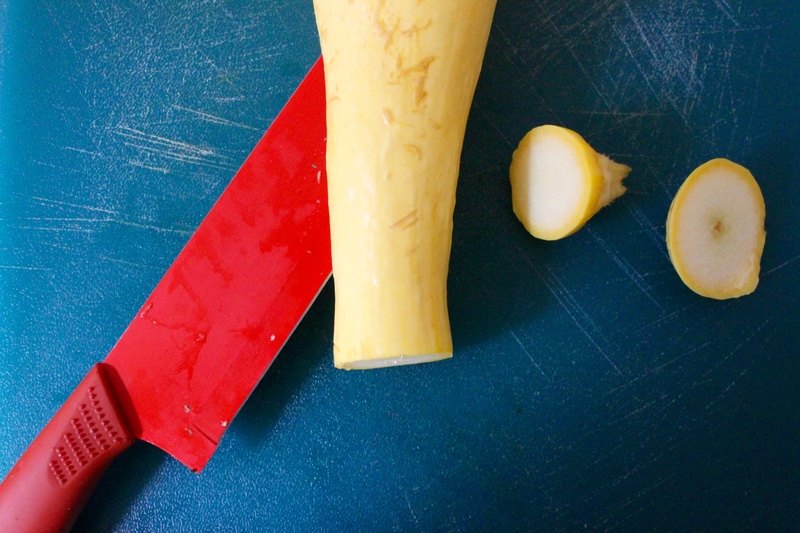 In a large bowl, combine zucchini, yellow squash, onion, olive oil, and white wine until vegetables are evenly coated. 4.) Place vegetables in baking dish. Place chicken on top of vegetables. Spread hummus evenly on top of the chicken. Sprinkle paprika or chili powder on top of hummus. 5.) 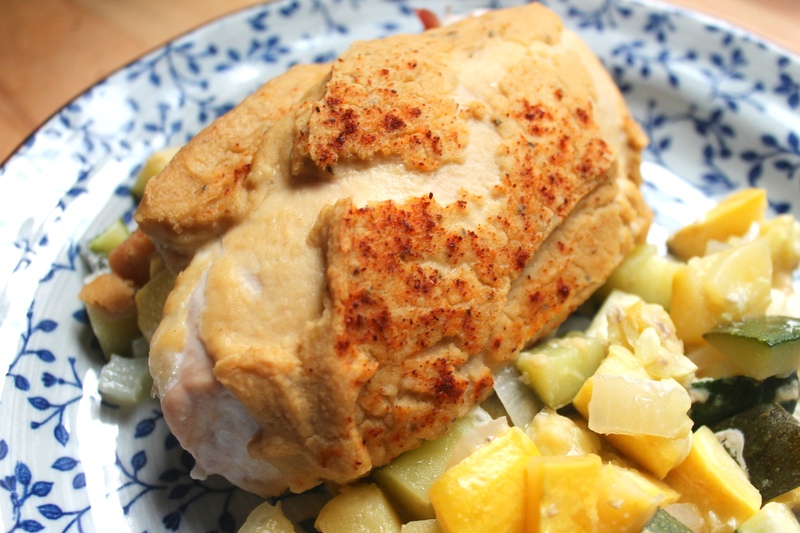 Bake for 30 – 35 minutes, or until chicken is completely cooked through. Let sit for ten minutes before serving.